The big story in reformy Chalkbeat NY's Rise and Shine, of course, is Eva Moskowitz. 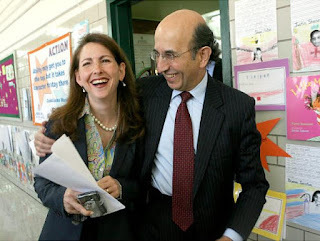 Moskowitz is under fire for the documented cruelty of one of her teachers. Alan Singer points out that this teacher is not actually certified but a Moskowitz mentor teacher nonetheless. Moskowitz, who refuses to sign the standard agreement for her pre-K program, can apparently certify anyone she wants however she pleases. Chalkbeat links to a number of stories stating that this sort of behavior would not be acceptable in wealthier schools. Doubtless that's true. I certainly would not want my child in this teacher's class, and it's hard to imagine parents who feel otherwise. In fact, the NY Times report suggesting students regularly pee their pants rather than asking for a moment less test prep leads me to believe this behavior is not, as Moskowitz claimed, an anomaly. The fact is Chancellor's Regulation A-421, against verbal abuse, would have landed this teacher in a ton of hot water. In NYC public schools, you simply are not permitted to address children in an abusive or hostile manner. In fact, the wording is such that pretty much anything that makes a kid feel uneasy can be construed as abuse. If you say, "hello," and it makes the kid feel bad somehow, a crazy principal could bring you up on charges. Nonetheless, I do not condone what this teacher did to this first grader. A teacher ought to be supportive rather than abusive, and anyone watching the video can see what's going on here. Children make mistakes all the time. I make mistakes all the time. We are human and ought to allow for children being human too. In fact, being children, they have a much better excuse than we do for mistakes. It isn't just private schools of the well-to-do that wouldn't put up with this nonsense. No public school principals worth their salt would accept this behavior. Here's the thing--charter schools are not subject to chancellor's regs. Abusive to children? Well, if it helps you get high test scores that's fine. Traumatized kids? Too bad. As long as Eva gets her test scores it doesn't matter. Does Eva have to follow the rules we do, the ones that say we can't grade standardized tests of our own students? Who knows? Rules don't apply to revolutionaries. After all, she's on a mission to privatize education and get it out of the hands of those nasty unionized career teachers. Certification? Bah humbug. Trained teachers might not know how to terrorize kids into high test scores with all that touchy feely stuff they learned at "college." At the end of the day, Eva says she's sick of apologizing. Sick of apologizing for her "got to go" list, sick of apologizing for the kids who pee their pants, and sick of apologizing for the downright abusiveness of her staff. Of course she hasn't apologized for her failure to sign the pre-K agreement. And why should she? Under a law her BFF Andy Cuomo passed, the city has to subsidize her schools whether or not they want them. She didn't get where she was by following rules, and if she has to abuse and terrorize kids to get what she wants, that ought to be good enough for anyone.